LG Electronics Vice Chairman and CEO Jo Seong-jin said the company will promote automation of suppliers’ manufacturing units as part of efforts to strengthen business partnership. At a meeting with a group of suppliers here, Jo said the company would share innovative features with them, such as building an IT system, to increase efficiency in production. 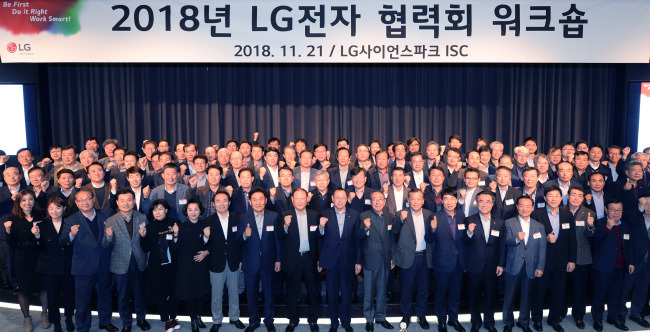 “LG Electronics has overcome many difficulties for the last 60 years by seeking change, innovation and cooperation for co-existence,” he said at a workshop held at LG Science Park in Magok, southeastern Seoul. The electronics giant also awarded 18 top suppliers in four categories that made progress in technology, quality and cost reduction, and set exemplary management. To prepare for an era of integrated technology, LG Electronics will adopt a variety of innovative technologies within suppliers’ manufacturing units both in and out of the country, to increase the competitiveness of parts used for the company’s devices, an official said.